Thanks for all the comments regarding my last blog post (the MPW video demo thing), I’m glad to hear that so many of you liked the video, and also liked the look of the product. As such I’m going to “roll” with the launch – I only ever do this with products that you express a strong interest in, and this certainly seems to be one of them! So to get the ball rolling (don’t ask me where all these “roll” references are coming from…maybe I need a sandwich?) I’ve teamed up with John and Dave to offer you a ton of bonus items. Full details on how to claim the bonuses can be found on my bonus page, and can be claimed as soon as you purchase MPW . Although do remember that MPW will launch on the 27th October, so there are still a few days to wait before you can get your hands on them! There’s also a very good free report that will keep you busy until the 27th if you head on over to the MPW website right now, as far as I know it’s going to be available until the 27th and then replaced by the sales page. So if you fancy getting your hands on the free report, click here to go to the MPW site, and the free download is located to the right of the little and large video! Multi Profit Websites – Lets Go Robot! It must be a special occasion, I’ve written a blog post! I will issue an apology for the lack of postings recently, if I were to be stereotypical, I’d make some excuse about working so hard I haven’t been able to find time to write anything…but I’d be lying. That’s not to say I haven’t been working hard – far from it, but there are 2 words that any UK male, under the age of 30 will understand – FOOTBALL MANAGER. Yes folks, the demon that is FOOTBALL MANAGER reared it’s ugly head around 6 weeks ago, and as such the blog posts have suffered. What can I say, I’m only human! But anyway, back to Internet Marketing. John Thornhill and Dave Nicholson are launching a brand new product – Multi Profit Websites (MPW) on the 29th October, 2009 27th October, 2009. The MPW system allows anyone to create a profitable niche website from scratch in minutes, no coding knowledge is required. Was it worth the 17 mins of your life I just took from you, I hope so….I don’t think my public liability covers that, but in all seriousness, you can see how easy it was for me to create what I think you’ll agree, is a pretty good looking site. 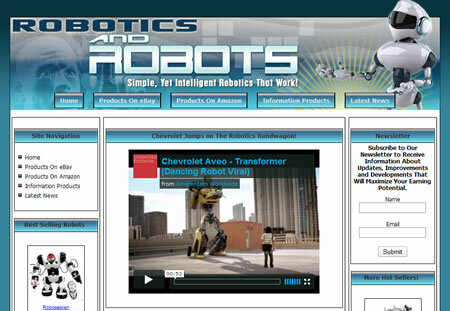 I created the website on a niche I know absolutely nothing about – Robots & Robotics, mainly to demonstrate how anyone can use it to create any kind of site. And as I showed you in the video, everything you can see on the site was added and edited using the online admin area, there’s no need to use HTML, PHP, CSS, MySQL or any other of those horrible abbreviations. You can also check out the site I created using MPW by clicking the link below. MPW will be launching on the 29th October 27th October, at a time that has still to be specified, but I will of course keep you updated with any news as and when I get it. I do also still have access to MPW, so if you have any pre-launch questions, or would like any more information please leave a comment and I’ll answer them for you ASAP.